For example, consider someone with £2,000 a month available to spend on a mortgage. At an interest rate of 4.5%, they are able to afford a loan of £360k on a traditional 25-year repayment mortgage. However, by paying the same monthly amount over 35 years rather than 25 years, the person could borrow £63k more. The chart shows how in the financial crisis of 2008/9, high LTV (>90%) lending fell sharply as lenders tightened credit criteria, with only a small rise in the proportion of longer mortgages. 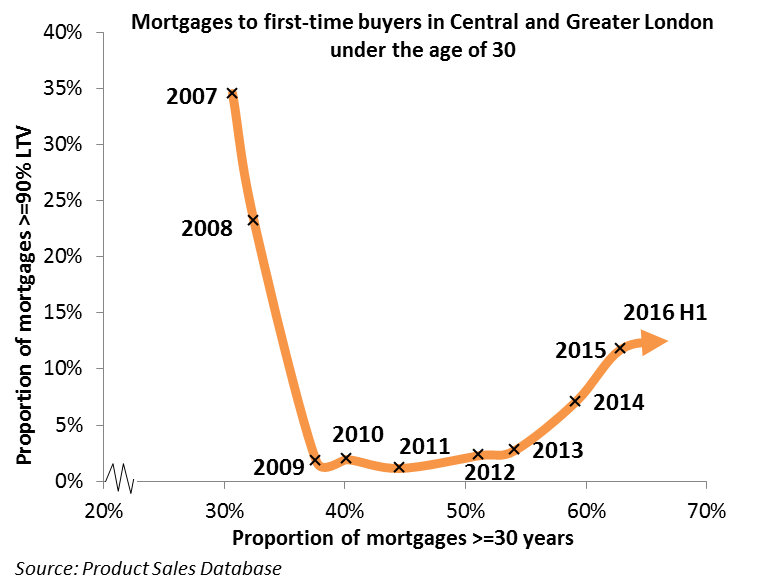 But then over the next four years, there were virtually no new high LTV mortgages, but a marked rise in longer term mortgages. Since 2013, both LTV and term have expanded. Although this trend towards longer-term mortgages might seem extreme, in countries like Sweden and Japan, ultra-long mortgage terms of up to 100 years are the norm. There are a couple of issues here though. Firstly, the person in the example would end up paying a massive £240k extra to borrow the additional £63k. Secondly, £63k is barely a couple of years price increases in London so how is this sustainable in the longer term? Apologies for the bluntness, but all increasing the tenor of mortgages will do is to increase prices further. Existing home owners and property investors will profits, and the young will be impoverished further. Wealth inequality will increase even more than it has already (simple statement of fact – additional money and value appreciation has gone to existing asset holders).